This document gives an account of several slaves bought by Benjamin Chambers and Thomas Ruffin's slave trading partnership. This document provides evidence of Thomas Ruffin's lack of morality regarding the selling of slaves. The document shows that Chambers purchased several slaves that were as young as 11 years old. 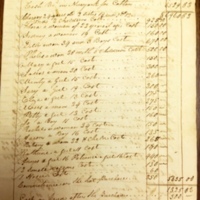 An Acct of the Purchase and Sale of Slaves made by Benjamin Chambers, 1823, Thomas Ruffin Papers, Collection 641, Southern Historical Collection, University of North Carolina at Chapel Hill. Benjamin Chambers, Account of Purchase and Sale of Slaves made by Benjamin Chambers, 1823, Civil War Era NC, accessed April 24, 2019, https://cwnc.omeka.chass.ncsu.edu/items/show/599.